For the Caribbean island, see Montserrat. Montserrat is a multi-peaked mountain in Catalonia, Spain. Santa Maria de Montserrat monastery situated high up in the unusual rock mountain is very popular among Catalans, and Catholic pilgrims come from far and wide to see the Black Madonna. The monastery is Catalonia's most important religious retreat and groups of young people from Barcelona and all over Catalonia make overnight hikes at least once in their lives to watch the sunrise from the heights of Montserrat. At 1,236 m above the valley floor, Montserrat is the highest point of the Catalan lowlands, and stands central to the most populated part of Catalonia. The stone monolith is ideally located to play an important role in the cultural and spiritual life of Catalonia. However, the one who expects a tranquil and enlightening experience at the top will be shocked to see that the surroundings of the monastery has many touristy boutiques, shops, stands and restaurants. Montserrat is about 48 km away from Barcelona, and is easily accessible by train, car and bus. Most public transit options will take you to the Montserrat-Aeri or Monistrol de Montserrat terminals at the foot of the mountains, where you transfer to cable car or rack railway to reach Montserrat and its monastery, high up in the mountains. If you plan to take the train from Barcelona, decide before you leave Barcelona whether you will take the cable car (from Montserrat-Aeri) or rack railway (from Monistrol de Montserrat) for the second stage of the journey because they leave from different train stops. You can buy a combined, round trip ticket for both the train and either the cable car or the rack railway when you depart from Barcelona, at a discount from buying individual tickets for each segment of the journey. Travelling from Barcelona, take Ferrocarrils de la Generalitat (R5 Line) train from Plaça d'Espanya to Montserrat-Aeri (or Monistrol de Montserrat respectively). Trains run every hour and travel time for the R5 is around 90 min each way. There are combined tickets available for train and rack railway or cable car, see website below. Autocares Julia leaves Barcelona Sants daily at 09:15 and takes you straight to the Monastry's Plaza del Funicular. Return trip departs Jun–Sep, 18:00 or Oct–May, 17:00. The trip is 1 hr 30 min and costs €5.10 each way. The top is also accessible by road, but it will cost you. The cheaper option will be to park at the cable car (free) or the Monistrol-Vila rack railway station an get up from there. There is also a very large free car park at Monistrol-Vila, on the north side of Monistrol de Montserrat. As well as being cheaper than the cable car, the stop at the top is slightly closer to the monastery and the other rack railways, and the last train down is later than the last cable car. From Montserrat-Aeri, take the cable car up to the monastery. The cable car is also convenient for those arriving by car. Parking at the Montserrat-Aeri rail station is easy and free. The trains arrive every hour from Barcelona, so there will be queues at those times, but it is quiet just before they arrive. If there is a long queue, it is worth visiting the El Rincon cafe. Go though the tunnel, turn left and follow the platform to the end. When arriving by train at Monistrol de Montserrat, change for the rack railway (also called the funicular, or the Cremallera de Montserrat). The rack railway uses the same train platform as the R5 train from Barcelona. The rack railway takes 20 min of travel and makes one stop en route to the monastery, at Monistrol-Vila (where the free car-park can be found). The service from the main station is always only one rack railway train per hour, but may be a service every twenty minutes from the rack railway's stop at Monistrol-Vila, so although it is a bit further to walk, you are likely to be better off going through the town there rather than crossing the bridge to the main station. When returning, make sure to get off at the right stop, depending on your onward travel option—by car (Monistrol-Vila, first stop from the top) or by train/bus (Monistrol de Montserrat, second stop from the top). The last funicular runs at 19:35 downhill. You can also hike up to the monastery from either Montserrat-Aeri (i.e. near the cable car) or Monistrol de Montserrat (the start of the rack railway and end of the regular R5 train), which takes about 1 hr or 1 hr 30 min respectively. Consult OpenStreetMap for the trails. Most of the Montserrat monastery complex is explorable on foot (it's not too big though!). If visiting the Santa Cova there is a funicular which copes with the steepest part, although its lower stop is a bit far away from the Santa Cova itself. It is very useful on the way back as it's uphill. There's also another funicular up to Sant Jeroni with great scenic views, however it's very crowded and can stop running quite early. The walking route down from the Sant Joan station is the route the staff use to drive cars up there, so it is an easy - if long - walk down. Also, see Funicular de Sant Joan and Funicular de la Santa Cova. Santa Maria de Montserrat is a Benedictine abbey which hosts the Virgin of Montserrat, and the Publicacions de l'Abadia de Montserrat, a publishing house, the oldest press in the world, still running, with the first book published in 1499. The Virgin of Montserrat is a statue of the Virgin Mary and infant Christ venerated at the Santa Maria de Montserrat monastery. Virgin of Montserrat (the black virgin), is Catalonia's favourite saint, and is located in the sanctuary of the Mare de Deu de Montserrat. It is one of the black Madonnas of Europe, hence its familiar Catalan name, la Moreneta ("The little dark-skinned one"). Believed by some to have been carved in Jerusalem in the early days of the church, it is a Romanesque sculpture in wood from the late 12th century. Legend has it that the Benedictine monks could not move the statue to construct their monastery, choosing to instead build around it. The statue's sanctuary is located at the rear of the chapel, where an altar of gold surrounds the icon, and is now a site of pilgrimage. In 1844, Pope Leo XIII declared the virgin of Montserrat patroness of Catalonia. L'Escolania choir school is a boys' choir of sopranos and altos based at the Benedictine abbey Santa Maria de Montserrat. When the repertory requires it, they are accompanied by the Montserrat Chapel Choir, composed of old choirboys and the monks of the Ministry Chapel Choir. L'Escolania sings every day in the Basilica of Montserrat, often to a great affluence of pilgrims and visitors from all over the world. The midday Salve has become, over the past decades, the most visited daily act of the Sanctuary. The Escolania, Montserrat’s Boys’ Choir, is one of the oldest in Europe, and performs during religious ceremonies and communal prayers in the basilica. The Museu de Montserrat is located at the plaza outside the basilica (the main outer plaza, not the smaller inner plaza). It contains a nice selection of religious art from Egyptian times through modern art, including works by Chagall, Dali, and other famous artists. Entrance is €7.00, and the museum takes about one to two hours to visit. Enjoy the fantastic views over the local landscape. This is best done by taking the Funicular de Sant Joan to the top. Montserrat's highest point, Sant Jeroni, can be reached by a footpath from the topstation of the funicular Sant Joan. From Sant Joan, almost all of Catalonia can be seen and on a clear day the island of Majorca is visible. Take the cable car ride up - definitely not for the faint hearted, this cable car is at some height! Hike around the peaks. Leave either from the monastery or from the top of the Sant Joan funicular. The main trails are well marked, but still do pick up a map at the information desk first. As you exit the rack railway or cable car, there is a fairly large curio shop across the way that carries a variety of tourist items, including Catalonian olive oil, chocolate, liqueur, books, jewelry, clothing, religious articles, and toys, as well as monastery-related goods such as recordings of the choir and guidebooks. There is another gift shop at the entrance to the museum that carries different items. There is also a marketplace, which offers many delectable homemade goods sold by locals, including canned honey, pastries, preserves, cured meat and candy. Also what can be bought is 2 cheeses that is provided only in Montserrat. 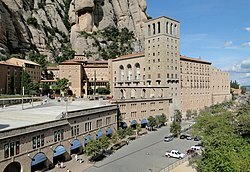 Restaurants in Montserrat around the monastery exist but are expensive. It's a great idea to bring your own lunch, especially if you plan to walk away from the central area or go up the funicular to the top of the mountain. There is no restaurant at Sant Jeroni, although there is a cafe adjoining gift shop where the rack railway and cable cars terminate at their upper ends (at the bottom of the Sant Jeroni and Santa Cova funiculars). If you're coming from Barcelona, a good plan is to get up early and head to La Boqueria, the big open market near the head of Las Ramblas, to stock up on sandwich ingredients and snacks - bread, cheese, meat, olives, wine, etc. Pack it up and bring it with you. Although the town of Montserrat is relatively safe and tourist-friendly, it can be very dangerous for hiking as much of it is uncharted woodland. If you are traveling with a group do not stray from them if you decide to go hiking. If you find out that someone has been separated from your group, summon the local authorities. It is best not to wander off the paths - there are steep drops, even close to the funicular top station. Colònia Güell – A tiny settlement famous for its modernist architecture, on the railroad line to Barcelona. This park travel guide to Montserrat is an outline and needs more content. It has a template, but there is not enough information present. Please plunge forward and help it grow! This travel guide page was last edited at 23:39, on 22 April 2019 by Wikivoyage user Ceever. Based on work by Wikivoyage users Balkanique, Ground Zero, Wrh2Bot, Ikan Kekek, Traveler100bot, Lovingboth, Doubleplusjeff and Davidbstanley, Wikivoyage anonymous user 195.77.54.53 and others.